TJ Thomas lives in western Massachusetts where she enjoys a quiet life with her college professor wyf, Elle, and their animals. TJ's passion is writing, and she spends much of her free time in that pursuit. TJ and Elle are equidistant from their two adult children who live in London and San Diego, and they enjoy traveling to all points in between and beyond. 3.0 out of 5 starsJinx Lover? Dawn Oliver has pretty much locked herself away. She does her painting and gardening but her decided to never give her heart to another. Did that before only to have the love trampled on, mentally and physically. 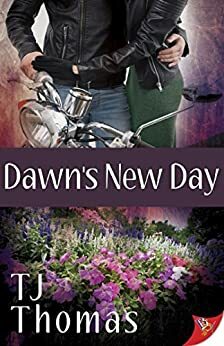 Cam Cooper who lost the love of her life but after being on her own for a while is now starting to open herself to the possibility of perhaps finding another to love. When Cam moves next door to Dawn she can’t help but to be drawn to her. One of the best things about Cam besides being a gorgeous butch, she brings into Dawn’s life her friends who quickly become a part of Dawn’s world. T J also reintroduces us to the main characters in her book “ A Reunion to Remember”. Very nice enjoyable read.